I've been meaning to write a piece about the Fashions of the years I went to Les Enfants Terribles and thought it would be fairly easy to do as the period does seem to be well-documented. 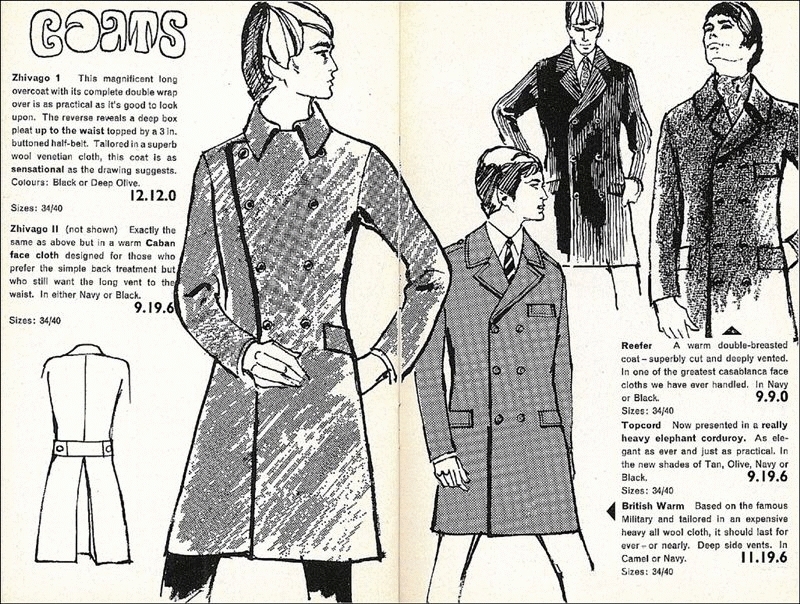 But alas, the documentation covers what the designers produced and what the models paraded in but it's proved harder to discover material relating to "the way we were". Some things appear to be self-evident and it didn't really take any prompting from Jon for me to bring up say "shetland sweaters" but I've not yet managed to find any decent photos, none at all from the period so I may have to take a snap of the couple I have left even though they were bought many years later. Mind you we do have a great picture of Sharyn in a delightful FairIsle. 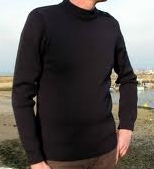 The shops that sold Scottish knitwear, Westerway & Westerway, W Bill, Scott Aidie, the Scotch House etc, no longer exist and the old crofter handwork is virtually extinct although I think I've some valid links for those interested. So I'm just going to babble on a bit, more or less at random, about what I remember and perhaps you'll all contribute some stuff too. Unfortunately I'm not even too sure my chronology’s correct so do please correct my errors. 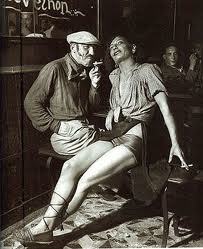 One of the first people I ever noticed at Les Enfants Terribles was a cheerful fellow called Michel. 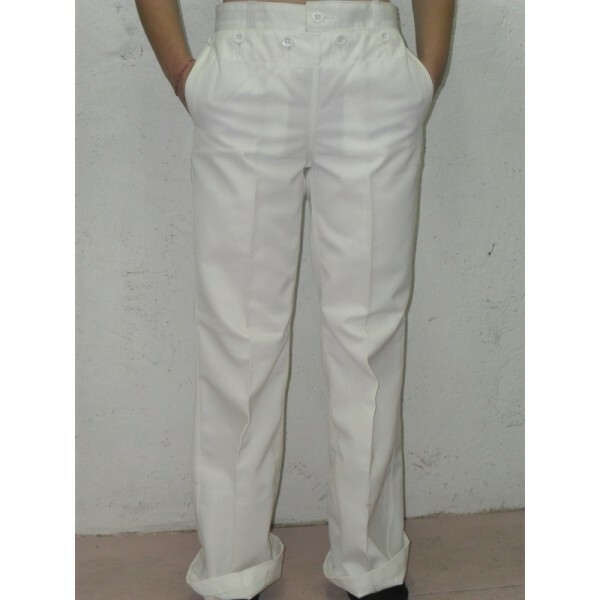 And it was his trousers that first caught my eye – French Navy surplus ducks with a drop front [pantalons à pont]. I of course failed to find a photo on-line but this pair seems to be the same though in white. 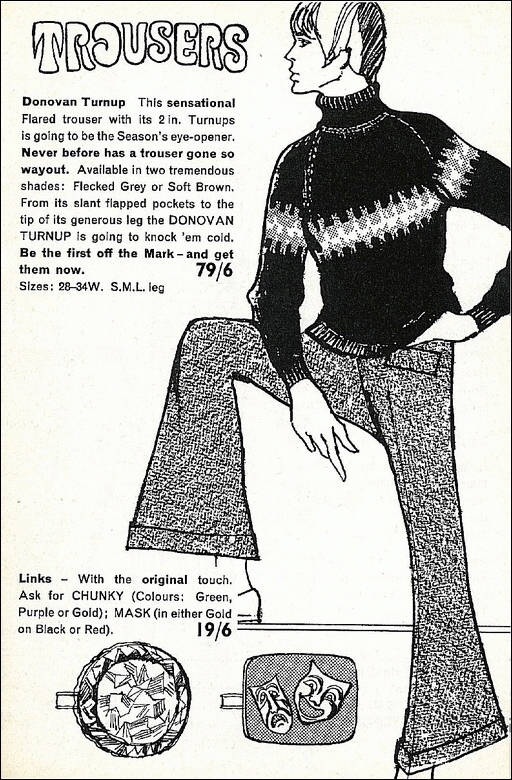 I must say I still feel the temptation to buy trousers like those! 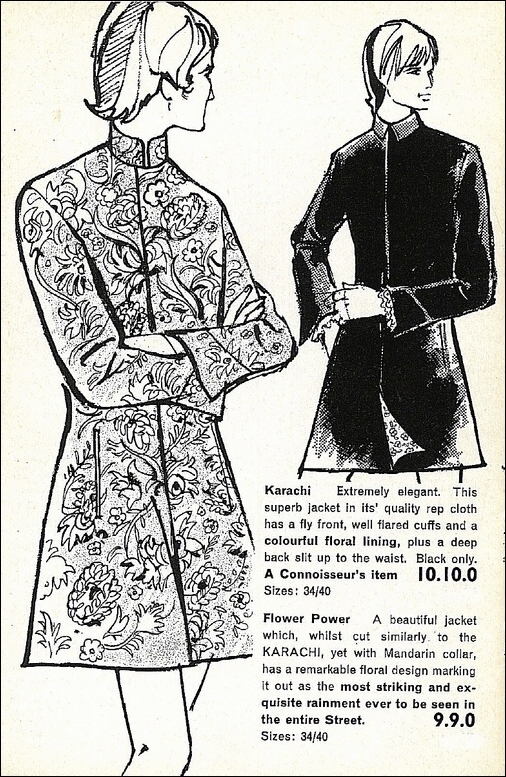 His I think had been tailored and were really snazzy. The second thing was his short, navy blue, tight crew-neck sweater – I believe it was in cotton but I couldn’t swear to it. Then there was his neckerchief. I’d only seen such things in cowboy films, usually on John Wayne, and bad “Carry-On” style sketches on the telly but his looked good. And a hair-style that allowed him to flip his fringe from his eyes. 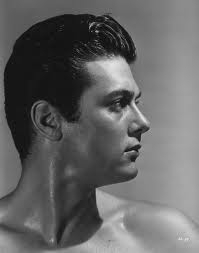 Now I really don’t think he was gay and I'm pretty sure he was not, before anyone makes that comment, it was a Fashion statement and very different to anything I’d ever seen before. 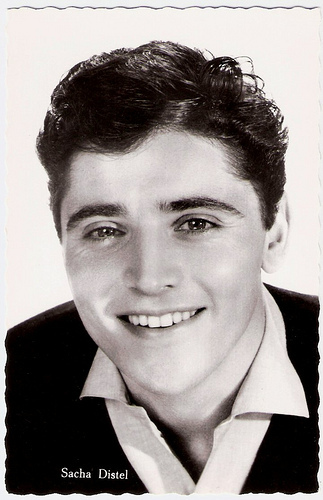 I seem to recall he was a bit older than us, didn’t speak English and at the time my French was I suppose of the typical school-boy kind (non-existent?) 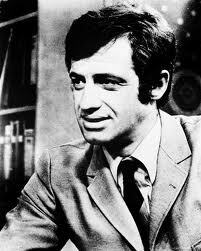 so I doubt we ever communicated but he did make an impression which I was to develop some time later. jon f Adrian: I always felt that the style you refer to was the kind of summer fashion worn commonly on the Cote d'azur. The Provincetown gay style that is now associated with it saw french clothes as a breakaway from stuffy conservative American male clothes of the 50's when non conformity was frowned upon there . For a reason that I’m going to have to investigate, things Scottish seemed to be in Fashion with mainland Europe in the early years of the 60’s. 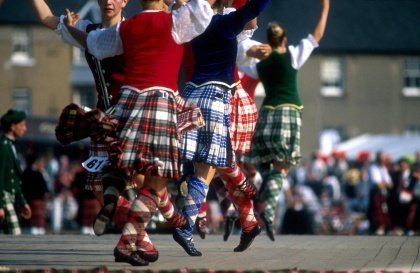 It seemed to me that every girl wore a kilt with loafers and some kind of sweater or cardigan – possibly cashmere before the Shetland craze arrived or even in marino wool. The kilts were genuine Scottish stuff, held closed with a leather strap thingy at the top and a giant nappy pin near the hem! They could have been bought from any of the Scottish woollen shops or even abroad. Sounds like a very unsexy kind of apparel in a time when the mini skirt was still shrinking towards it’s apotheosis as a belt, but fortunately they were worn too – by the same girls mostly, just in a different mood or was it in fact a different year? 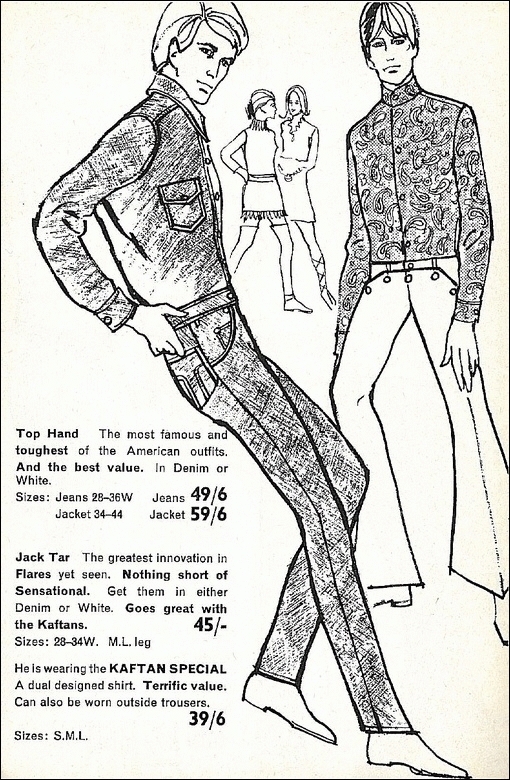 Trousers were worn too, in gabardine, velvet or corduroy for both boys and girls in addition to the ubiquitous Levis which were mostly 501s in the beginning and until I lost count they went through so many numbers in those years and a plethora of styles. And they just got tighter and tighter! Levi cords were very popular too around 1967, 68 and came in I don’t know how many colours; I had quite a few in my wardrobe I remember. Green, black and burgundy, and beige I remember but there were perhaps more colours even than those. Vibeke / Vibi The kilts were usually below the knees when we bought them at Scott Aidie's, so we just used a pair of scissors to get them in the right length above the knees. 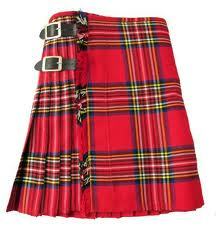 Then they were 'suitable' for wearing in Le Kilt !! The leather jacket! Not a black motor-cycle jacket like Marlon Brando’s but a brown one we were lead to believe were flying jackets. 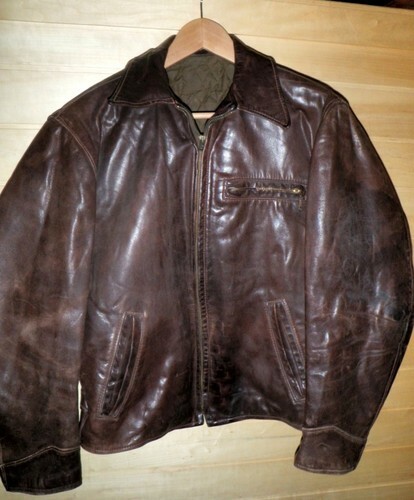 Not the lambskin kind which really were flying jackets worn by early pilots, though some did have such, but brown leather, in fact often horse hide. I now know, or do I just believe, they were just jackets worn by taxi drivers, lorry-drivers etc all over the USA although some may well have even been worn by aviators too. 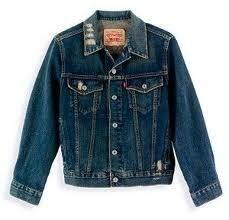 The Levi jacket! Wow! 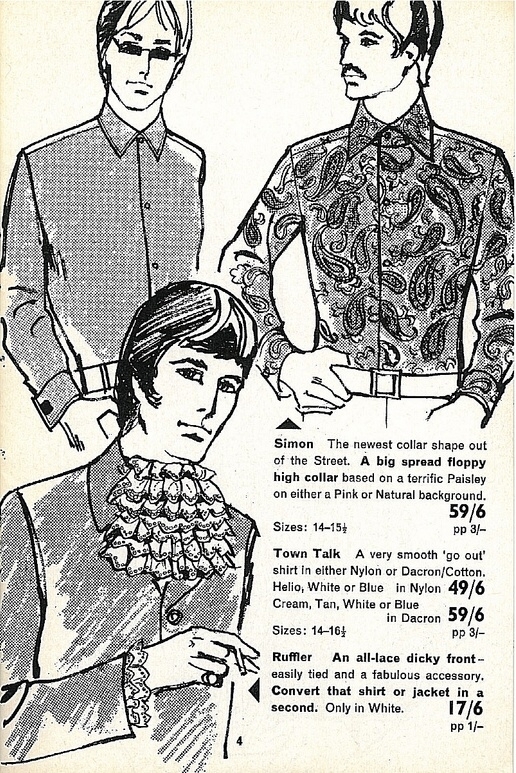 I had a white one that had to be washed so often and starched and ironing it was such a pain but it looked sharp I think and of course worn with the collar turned up. 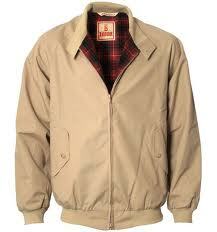 The Harrington or Baracuta G9 as it’s properly called was also often seen and mostly in beige I think. 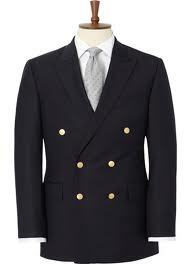 Which now brings us to the blazer. Double breasted, long and with narrow, “natural” shoulders. 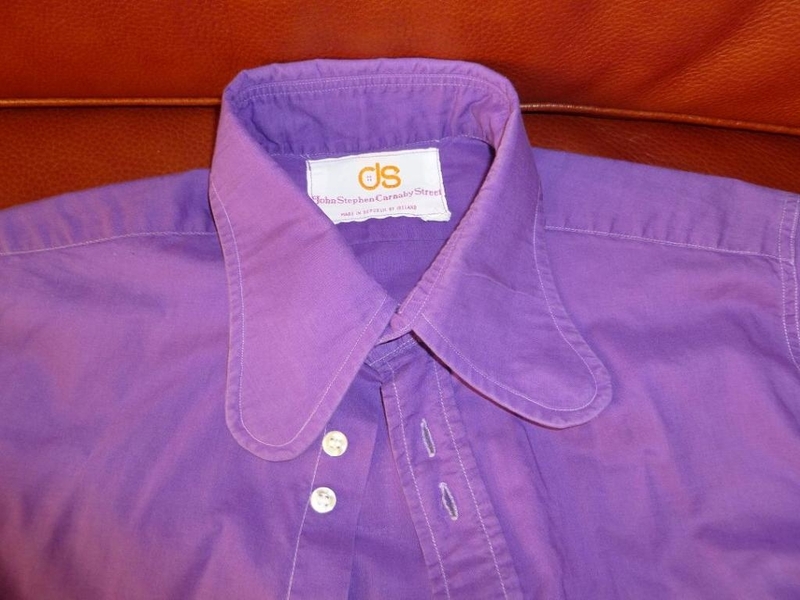 Gabardine and most often worn with gabardine trousers too – with turn-ups. 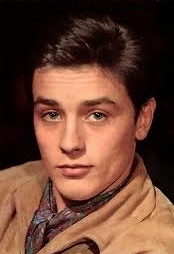 jon f Blazers in France for "les minets" had high square shoulders not sloping as in the UK. 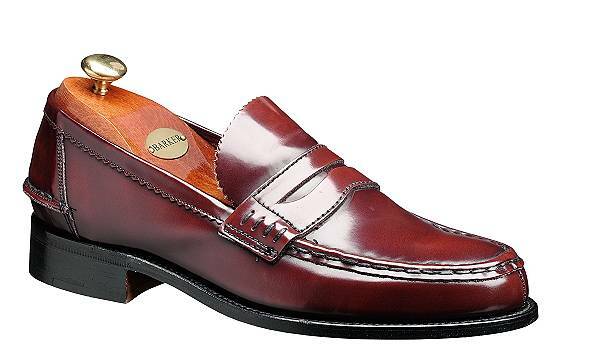 I think they were called "epaules Kennedy"
Shoes! 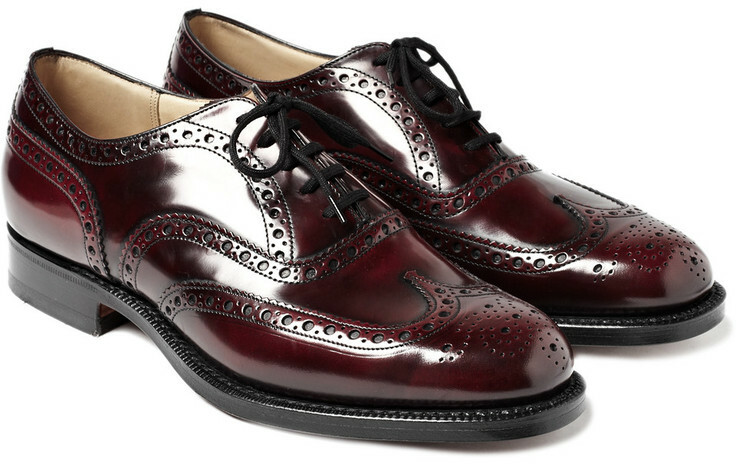 Brogues were very popular – exclusively brown and if possible with a fringed lace cover. These were I think the forerunner of the golf shoe but again somehow Scottish. 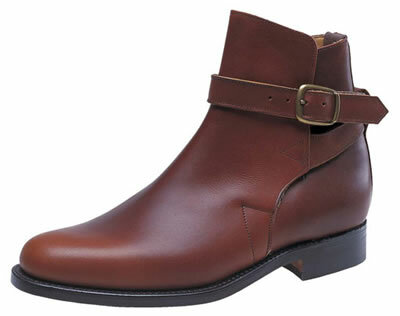 Jodhpur boots! Again brown and only the genuine strap version was allowed, no elastic gussets here. And strangely although again only ever worn in brown (all right the occasional black pair was seen) they had to be polished with black polish to produce the right patina and shine. I’ll never forget wearing-in mine. I think I must have used up a tin of sticking plaster as the damned things were never meant to be walked in and the straps had to form the boot before they were even half comfortable – but then they were fine and looked great with Levi’s – but never worn with trousers and certainly never with anything with a turn-up. Penny loafers or weegians were another common shoe for both boys and girls and yet again only in brown. They were hellishly expensive I remember; brogues that looked good could be bought from Saxones, but the only proper loafers were by Barkers and although perfect they came at a high price. The pennies in question were American ones not English; ours would never have fitted into the slots. Legend has it that this was supposed to be telephone money “in case” but then telephone calls via Ma Bell were obviously cheaper than our four pence. Anyone remember tapping the number with the cradle? I have a vague memory that it actually worked. Anyhow my auntie worked for the electricity company (LEB) in Carnaby Street would you believe and this was a time when many people still had meters for both gas and electricity. Well American 25 cent coins, quarters, often turned up when they emptied the meters and as these could not be paid in to the bank most made their way into the hands of employees relatives; the young ones. So that’s what I had in my loafers, shiny silver quarters. I still have the coins and they sit in my current pair – I think only my third since 1966 or so – the quality of the Barker shoe is extraordinary! jon f The cover over the brogues laces is called a "kiltie" and older golf shoes did ccoem that way. Impossible to find now as golf shoes are more sporty than traditional now however tassel loafers ordered from LL Bean still have a kiltie. jon f In Canada the 1 cent (penny) has been phased out. Luckily i have few uncirculated and shiny to insert as required in new loafers from LL Bean, Bass used to make weejans in Andover Maine but since moved it all offshore , not the same quality . 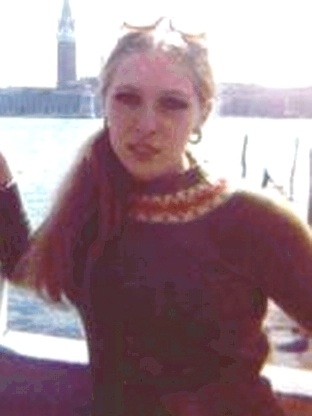 Now hair is another story and I’ll confess to not really being able to remember any hairstyles for girls beyond the Jane Asher look and the Cathy McGowan look – but there must have been more, weren’t there? Thanks to Jon for reminding me about raincoats! 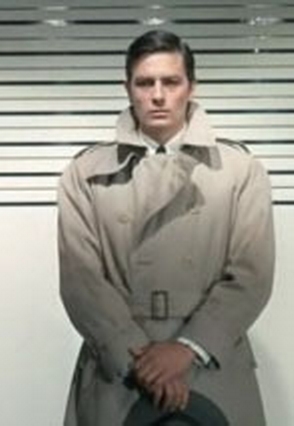 Some wore trenchcoats even Burberry's, but not I. The Fashion, whoever started it I know not, was for riding macs - yes the true mackintosh. They got so dirty in London, especially mine that was long and swept the stairs of the No 6 bus as I descended from the upper deck where one always rode in order to be able to enjoy a fag. Scrubbed in the bath with soap and the scrubbing brush meant for the front stoop (if you lived in Lancashire I suppose!). Came up a treat! 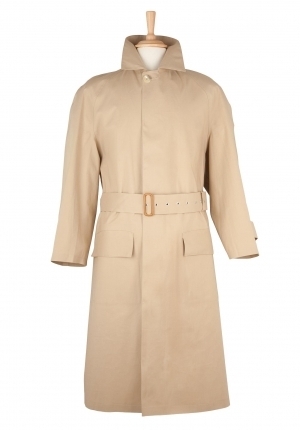 Sheila Rowhan I had one too, it was like Harold Wilson's raincoat and got very dirty quickly, can't remember where I bought it from. p.s. I had to wash mine too with soap and a scrubbing brush. I don't know if all the French au-pair girls came from rich families or just starved themselves for the sake of Fashion but most seemed to have the same handbag. 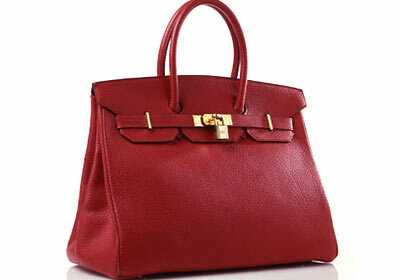 I had no idea at first what it was - nice as it was - but learned later that it was a bag now known as a Birkin (but this was before HER time so they weren't always called that, were they? ), horribly expensive but beautufully made. Which once more brings me to the subject of Fauchon. Does anyone else remember her? From the Kilt mainly. My memory says she belonged to the family that owned Hermès but I don't know if that's true. Lived in Battersea with a friend of the family. Little butch but charming girl I remember! For accessories I recall for guys a heavy silver ID braclet only available in France. Finally watch straps were stipped nylon in various colours ! sports coats with hook vent at rear. Knitted ties were also popular, chelsea boots with elastic sides despite what another wrote ! clarks desert boots, surplus gear from Milletts. There are still a number of guys in UK who, like me, follow the classic Ivy League style aided by US Ebay.com but we are dying out sadlyt. 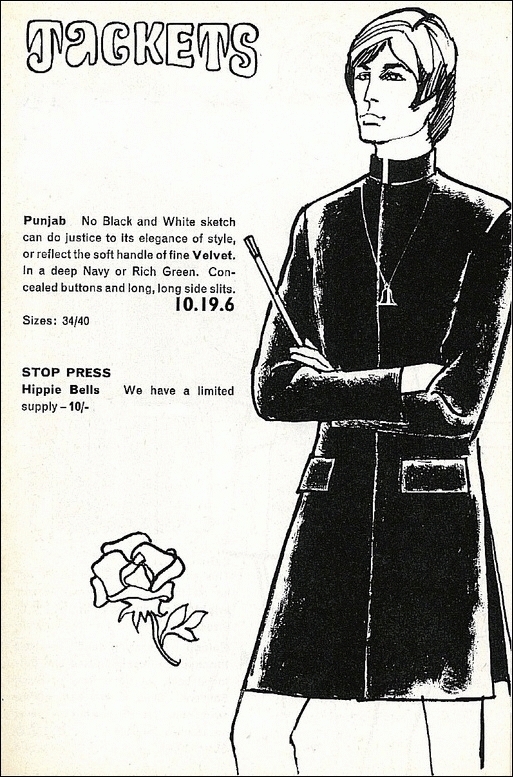 En parlant de mode, je me souviens qu'en 1966 j'étais présent lors de l'ouverture de Lady Jane, la première boutique de mode femme dans Carnaby Street, en face de Lord John et Gear. Afin de se faire rapidement connaître auprès des "Fashionistas", les propriétaires avaient eu la sublime idée de faire poser des filles en tenue légère dans la vitrine. Vu l'intérêt énorme de la part des passants ainsi que de la presse, la rue était complètement bloquée mais aussi vite dégagée par les flics accourus en très grand nombre. Les filles ont été embarquées et amenées au poste de police. Vise la tenue des mecs, tous en costard-cravate ! Now Jon's reminded me of another phenomenen - Newman jeans. I'd forgotten all about them as it happens. Beautiful corduroy jeans - and a great fit too. I've searched on-line but can't find any and then remembered that in my photo with the bad hair I'm actually wearing a pair in green if I remember correctly. So there you are! Newman cords. More expensive than Levi's and only available at Browns in South Moulton St. Velvet trousers and jackets from The Village Gate corner of Marlborough St and Carnaby St. Jon' s red scarfs worn over a shetland or a coat Un home et une femme, Vivre pour Vivre , two great films of the epoch. jon f I will never live down that red scarf :) I was the "bees knees" in it. 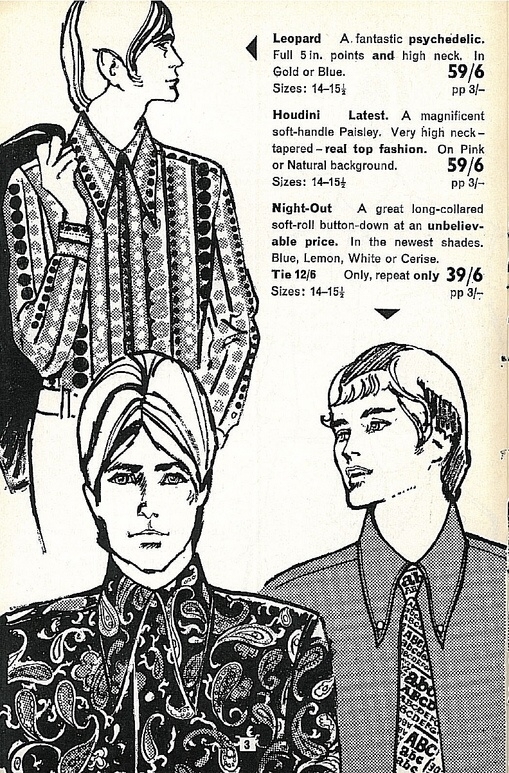 jon F was wearing it New Years Eve 68/69 in Trafalgar Sq . some one tried to pinch it of me but nicely gave it back. Who knows what can happen in such a confrontation these days. Bien que personellement j'ai toujours préféré les chemises unies, voici une petite sélection de chemises qui font très Carnaby Street des années soixante. 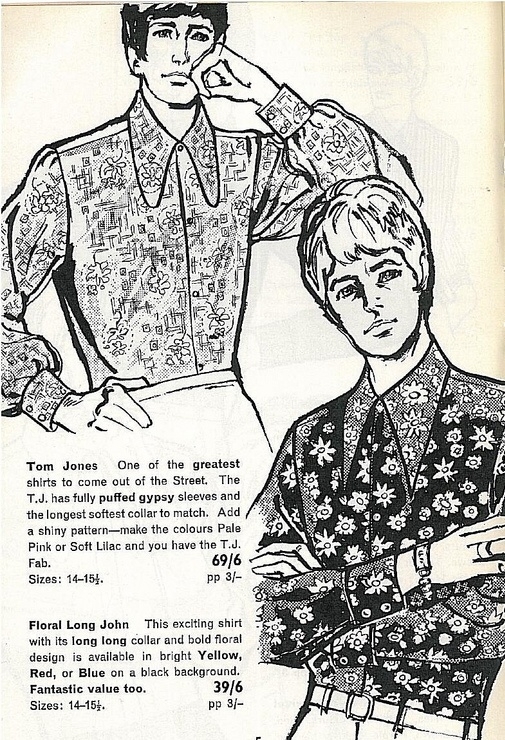 So far I've not said much about women's Fashions and that's probably because I'm going to need some help. 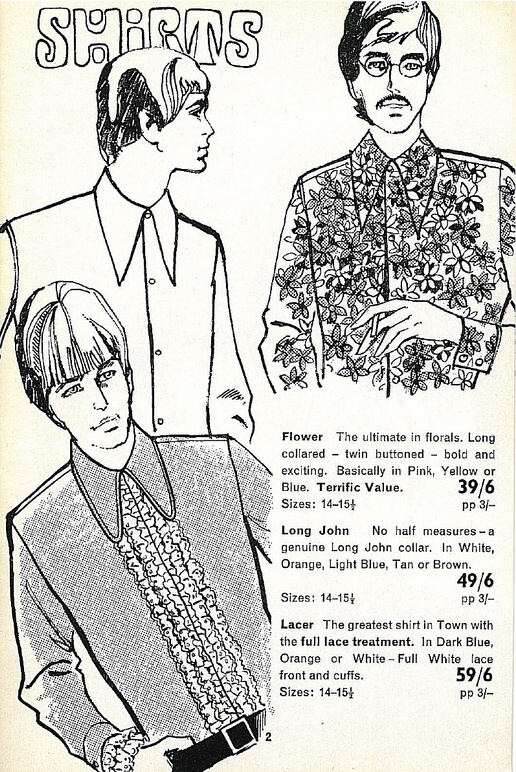 Not that we didn't see what they wore - I'm sure we noticed but 45 years later I no longer know nor can recognise genuine stuff and distinguish it from later resurrections of sixties styles. 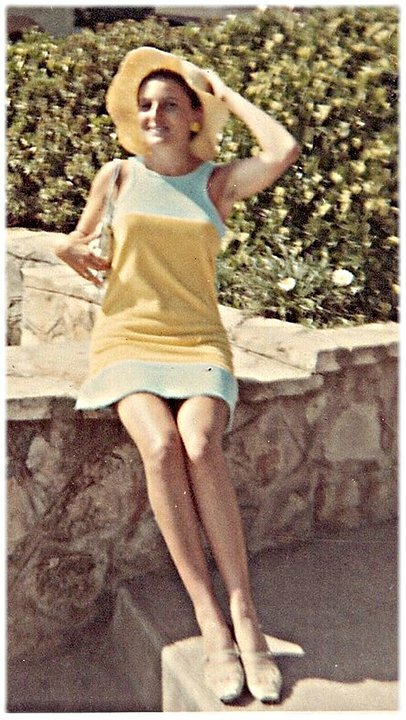 This picture is of Marie-Christine, I think from 1968 and is just a typical and very lovely example of what girls looked like in a dress! Wish I had more! 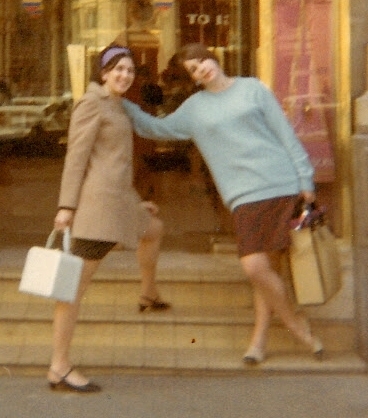 And this is Lesley White and a friend in Paris in 1967 - taken outside the Drugstore, Champs Elysées. jon f I took this picture of Lesley White & Susan Sheridan -Easter weekend 1967. Lesley and her cousin Richard were part of the south London habitues Sunday afternoons at LET. 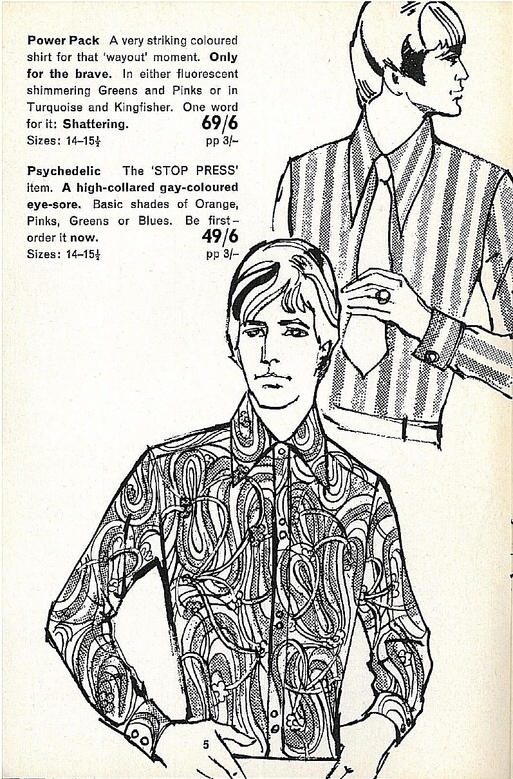 Paul's sent me some more interesting pictures of sixties Fashions for men, I think from the same catalogue as the previous ones. I wonder if anyone will own up to having worn them? 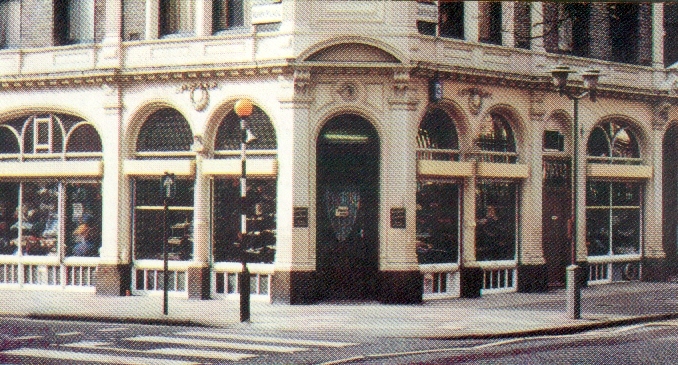 En complément aux cinq pages de brochure publicitaire d'une boutique de Carnaby Street que je t'ai envoyées il y a quelques mois et dont je ne me rappelle plus du nom, représentant des chemises homme, je te transmets, en annexe, une autre page que je viens de retrouver, montrant des modèles de manteaux typiques de l'époque.